Find out how one St. Louis mom is breaking the code with accessible programming courses for kids. It all started when St. Louis native Shay Gillespie took her 9-year-old son to his very first coding workshop. After only an hour, he was hooked. Like any mother who wants to support their child’s hobbies and interests, Shay searched for longer classes in programming that he could take near their home in North County. To her dismay, the only thing that came close was a robotics class out in Chesterfield. “You do what you have to do for your kids, right?” she asks rhetorically. “So every Wednesday for six weeks, I drove him to Chesterfield for this class.” The hour-long commute gave Shay plenty of time to think, and it was during these drives that she decided to put something together in North County for kids like her son. After polling her friends and community with a single question posted to Facebook, Shay learned that if she were to find an instructor to teach kids how to code, she’d be solving a problem that many families face today: how to help a child take their interest in computers or video games and turn it into something even more fulfilling. Not one to shy away from a challenge, Shay began laying groundwork for what would eventually become Color Coded Kids, St. Louis’ first coding “bootcamp” for children. Today, Color Coded Kids is offered in 3 major US cities: St. Louis, Arlington, VA and Houston, TX. She plans to expand to 20 total cities in the next 5 years. It’s no secret that most companies today lack diversity among software developers. Underrepresented groups face structural and social barriers in access and exposure to subjects like computer science. Shay and her team believe that by starting with children, they can help reverse that trend for an entire generation of future developers or more broadly, entrepreneurs. Under CCK’s core values of Respect, Enthusiasm, Attitude, Client Satisfaction and Honesty and Integrity (REACH), kids who attend the classes will certainly be challenged in the best way, in the best environment. On June 4th, Color Coded Kids launched in Dallas, TX. This class begins our 12 week Video Game Design course, in which each student will learn how to code their very own video game. The class is taught by Lan Hardy, an experienced developer and trainer located in the Dallas area. Lan is a great addition to the Color Coded Kids team and we look forward to her certifying our CODEts! Houston, We have a Problem! Microsoft Store is now Color Coded! 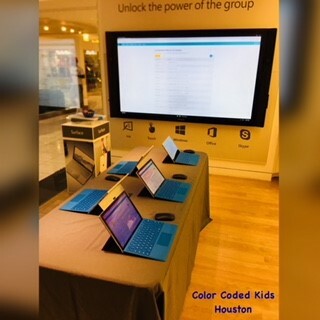 In October, Color Coded Kids began offering classes in the Microsoft Store in the Galleria Mall in Houston, TX. The class mirrors the video game design 12-week course being offered in St. Louis and Arlington, VA. The developer, Jason Rodgers has many years of software development and programming skills. Color Coded Kids Video Game Design course will be offered multiple times throughout the year. For more information, please visit Become a CODEt in Houston. Color Coded Kids in Cool Valley! Color Coded Kids volunteered at Cool Valley Elementary School's STEAM night on Thursday, March 16, 2017. Students rotated room to room doing activities related to science, technology, engineering, art and math. Color Coded Kids showed the basic functions of coding and helped the kids find their way through programming exercises. Many of the kids had never heard of coding and was fascinated with how it works. It was a great way to spend the evening! Image 1: Founder, Shay Gillespie helping students with writing code. Image 2: Students writing code and understand the basic of computer programming. Listen to CCK Founder speak on entrepreneurship and stepping out of your comfort zone. Entrepreneurs are driven to identify and solve problems. In the entrepreneurial ecosystem it’s called the “pain” point of customers. Shay Gillespie and Jared Arms created their businesses out of distinctly different sources of personal pain. Coincidentally, each had a passion and focus to improve opportunities for African-American children in the technology sector with coding and programming instruction. Shay, the founder and owner of “Color Coded Kids” knows the impact of technology on a global scale and from a corporate vantage place, while Jared, at just 23 years old, founded “Kylar for Kids” and entered into the IT space from a very different and unlikely point of origin. Shay needed a practical and accessible source for IT instruction for her young son and discovered most of the mothers she knew shared that need. Jared got started while responded to the pain of losing friends and loved ones to gun violence. Each of them stumbled onto very viable answers to a common community need—access to resources and information. Both now have not only created opportunities for themselves, they have changed the landscape for generations to come. This is not an average conversation. Join Cheryl and Christy with Shay and Jared in this episode that will change the way you view entrepreneurship, your roadmap and unforeseen business opportunities. How finding the answer to the unasked questions can become your great business idea! How important the role of a mentor and partnership can be in getting your idea off the ground. What do you do if you don’t know all there is to know about your business, industry or market? Where you can find great programming instruction for your kids, yourself and the elders. How you can earn a significant living in the IT sector with unlimited opportunities. Color Coded Kids is in the Microsoft Store! Arlington, VA – February 27, 2017 - Color Coded Kids (www.colorcodedkids.com) will launch a 12-week program designed to teach students software development in its new location in Arlington, Virginia inside the Microsoft Store located in the Fashion Centre at Pentagon City. Classes begin April 29, 2017 at 1:00 pm for one hour a week. According to a report published by Microsoft, there will be 1,000,0000 unfilled software development positions in the US by 2020. Color Coded Kids is gearing up the next generation of technology leaders to ensure there is an abundance of resources for those unfilled positions.